Adrian Hunter, the son of a duke's daughter and a black abolitionist, is determined to do whatever his family needs—even posing as a valet to gather information. But his mission spirals out of control when he’s accused of dastardly intentions and is forced to marry a woman he’s barely had time to flirt with. 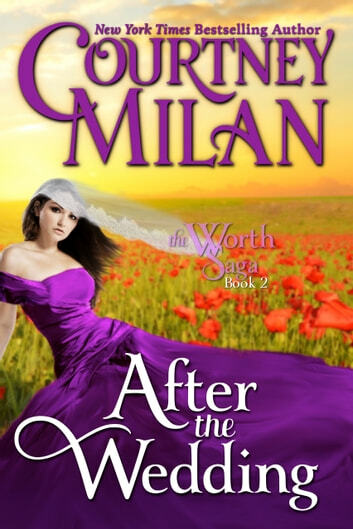 After the Wedding is the second full-length book in the Worth Saga. It is preceded by Once upon a Marquess, the first full-length book. The series books stand alone, but those who wish to read in order may want to start there. Also available in the series are Her Every Wish, a side-novella, and The Pursuit Of..., which is something of a prelude. This was my first foray into the Worth Saga and I will certainly be going back to Once Upon A Marquess to read more — this was a sweet and funny and honest book that made me very happy. I loved Camilla discovering that she can be loved, and Adrian’s kindnesses. There are plates that are designed, legal affairs to sort, and some delightful younger siblings I can’t wait to read more about one day. 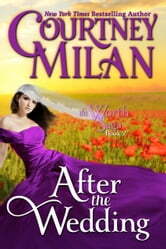 I like Courtney Milan and the interesting backgrounds she gives her characters. The couple has a lot to overcome but their sincerity and kindness allow them to triumph over people who are selfish and calculating. It’s a cute read.